Gülru Necipoğlu and Alina Payne, ed. Histories of Ornament: From Global to Local. Princeton: Princeton University Press, 2016. 464 pp. 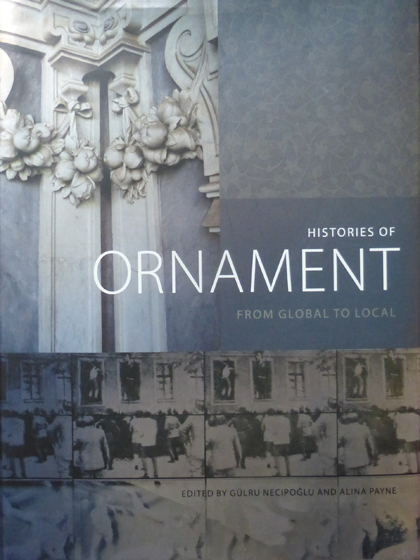 “Ornament is back,” or so the conveners of this richly illustrated volume proclaim (p. 1). Post-Enlightenment critics have long dismissed ornament as a superfluous frivolity: Immanuel Kant famously condemned Zieraten as “paregonal” to the artwork proper—empty Schmuck that “takes away from general beauty” (der echten Schönheit Abbruch [tut]); at the beginning of the twentieth century, Adolf Loos went even further, heralding ornament a “crime” (Verbrechen), as “freedom from ornament is a sign of spiritual strength.” Yet for all the talk of abolishing ornament, the ornamental itself appears to be flourishing: “from our vantage point today, what seemed a definitive and irreversible death blow to ornament turned out to be only an ushering in of a protracted phase of its disappearance” (p. 1). Gülru Necipoğlu’s and Alina Payne’s book—derived from a Harvard conference in 2012—takes its place alongside numerous other recent art historical forays into “ornament,” “pattern” and “decoration” (a “turning tide in scholarship”) (p. 351 n. 2). What is special about their particular contribution, however, is the challenge to Western essentialist frameworks, “asking larger questions about transnational exchange and circulation of ideas, forms, goods, and people” (p. 4). The book “does not seek to circumscribe the definition of ornament,” but rather “to address what ornament does”; “above all, it stresses the almost uninterrupted and instrumental function that ornament has performed, and continues to perform, with its perennial capacity to ignite the artistic imagination and give aesthetic pleasure” (p. 6). The subtitle draws out this specific perspective: ornament is duly conceptualized as an “artistic currency of exchange”—something with “contextually specific geo-historical significations” on the one hand, but simultaneously “transcultural” on the other (p. 4). The “global to local” framework also helps to explain the editors’ thematic approach. The book consists of 26 chapters, organized around seven topics: some are defined around media (with particular emphasis on architectural adornment—above all in the section on “Contemporaneity of Ornament in Architecture”); others are framed around periods (“Mediaeval Mediations,” for example), or else tackle conceptual and historiographic issues (“Ornament between Historiography and Theory”; “Ornament between Figuration and Abstraction,” and others). Islamic materials receive rich discussion throughout—with scintillating discussions of Iranian and Moghul Indian materials in particular, as well as European mediations of the “arabesque.” Yet the parameters are squarely visual in scope; there is only passing mention of important literary critical comparative perspectives, for example, and still fewer references to ornament and music (se pp. 93, 136, 138, 195, 199, 324–25). Barring some passing comments on “late antiquity” (above all in relation to Alois Riegl), the book likewise charts an unabashedly “modern” course: “we purposely excluded topics of ancient ornament, in the interests of promoting a more tightly integrated volume” (p. 4). What of the chapters themselves? Given the large scope of the volume, and its polyglot cast of contributors, it’s perhaps unsurprising that chapters are a tad uneven: some authors engage head-on with the critical agenda of the introduction; others hone in on their specialist local areas, with minimal interest in the global questions. Three personal highlights can convey the general flavor. First comes Finbarr Barry Flood’s discussion of the “Flaw in the Carpet: Disjunctive Continuities and Riegl’s Arabesque,” which manages an exemplary combination of historiographic critique and close formalist analysis. Christopher P. Heuer’s turn to “Ornamental Defacement and Protestant Iconoclasm” offers a rather different perspective, discussing the theological scaffolding that props up modern Western ideologies of visual signification (‘long before Kant or Derrida, . . . northern iconophobes distinguished between ergon and parergon, or between more or less potent aspects of an image” [p. 156]). Third and finally, Jennifer L. Roberts literalizes the editorial talk of “the currency of ornament,” within a scintillating chapter on “Machine-Lathed Anticountefeiting Patterns and the Portability of Value.” The challenge of authenticating printed dollar bills, Roberts argues, fostered a unique sort of “ornamental solution”: ‘”machine-lathed ornament was uniquely capable of negotiating the ontological wobbliness of the paper money system during the early nineteenth century” (p. 314). Given the book’s important contribution to global art history, the sentiment struck me as an apt conclusion: if money makes the world go round, it’s ornament that provides a common gold standard.